The Young Architecture Duo Pile It On For Art Basel Miami Beach. "Tent Pile," Design Miami Entry Pavilion, 2013. Every summer for MoMA PS1's Young Architects Program, the Long Island City museum selects one project by an up-and-coming architect to be built in their courtyard. In 2011, two Princeton grads, Julian Rose and Garrett Ricciardi, entered the competition with a design from their brand-new firm Formlessfinder. "We were very fortunate when someone in the audience at our thesis jury asked if we'd be interested in submitting something," recalls Rose. 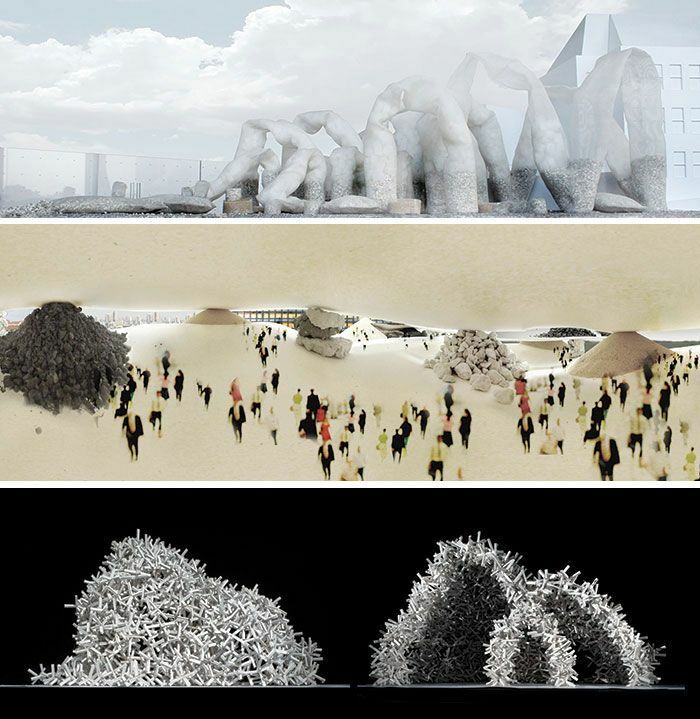 But the Brooklyn-based firm's proposal -- prehistoric-looking rock and recycled aggregate-and-foam-filled geo-textile fabric arches -- didn't win. "It was definitely disorienting and disappointing at the time. We were fresh out of school and we didn't have a clear sense of how often these opportunities come up," says Ricciardi. Two years later Formlessfinder got another chance. 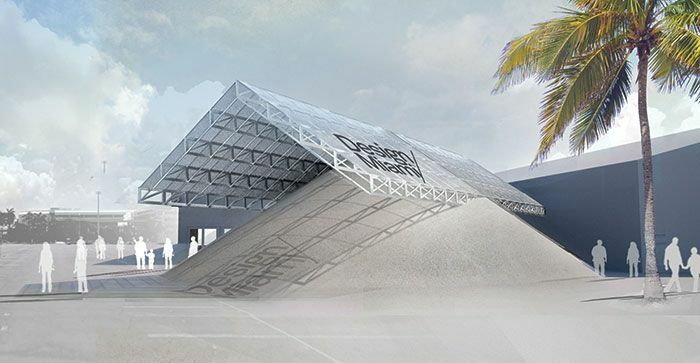 The director of exhibitions at Design Miami heard about the duo's eagerness to move beyond traditional forms and building materials, and asked them to submit a design for the entrance to the annual fair's pavilion at Art Basel Miami Beach 2013. "We got a cold call in late May, and it all happened at a fairly quick pace," says Ricciardi. "We had two weeks to develop a concept, and within a week they let us know that we had been selected." For their submission, which they dubbed "Tent Pile," the pair incorporated elements they equated with the tropics, placing an aluminum cantilevered roof on top of a giant pile of sand. "When you're confronted with a pile of sand, you kick your shoes off and put your feet in, and you start to look at architecture in a different way," says Ricciardi. "There's an informality that's not imposing, so hopefully people will start to play with it in unexpected ways." (Top to bottom) "Bag Pile," PS1, Elevation, 2011; "Load Test," Interior view, 2010; "Burr," Elevation & Section, 2010. The structure is temporary -- it will only be up during the first week of December after which the sand will be recycled -- but the exposure at the popular design and art fair is sure to open doors for Formlessfinder to build more permanent works in the near future. "There's a lot of expertise in ["Tent Pile"] that is maybe not completely evident," says Rose. "Normally to support a canopy like this, you would be digging holes and pouring concrete. Here, it's the sand that allows the structure to work. Architects need to interact with a lot of experts, like structural engineers or mechanical engineers, but it shouldn't be so deadly serious that it doesn't have that spontaneous feeling." "Tent Pile" will be on view at Meridian Avenue and 19th Street as part of Design Miami, 2013.